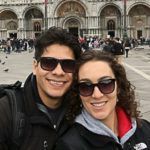 We have been living in Florence for over a year and still discover new things to do all the time. If you are on holiday and don’t have the luxury of exploring everything the city has to offer, I’ve narrowed it down for you. Here is an itinerary to enjoy 24 hours in Florence, what to see and places to visit. 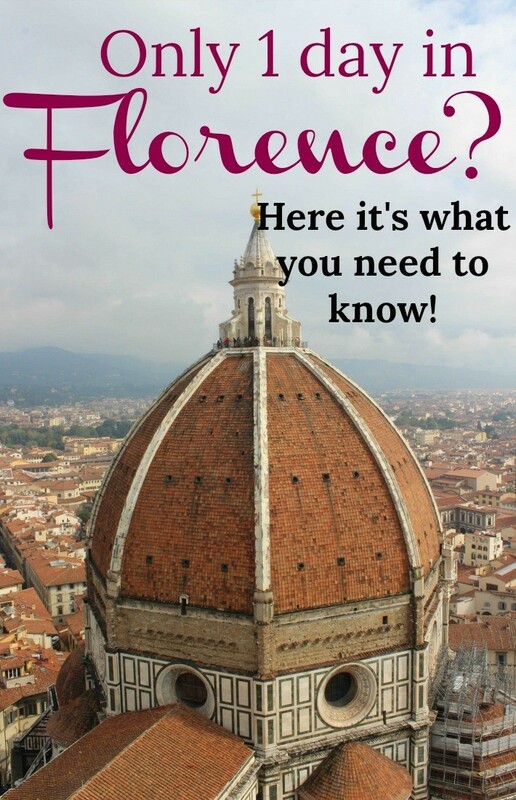 Plus some recommendations on where to stay in Florence and where to eat. With a little tenacity and a sense of adventure, you can nail it down and have fun. Start your day with a traditional Italian breakfast, essentially espresso and a pastry, don’t waste your time trying to find a western breakfast. They are rare, expensive and usually are not very good. The espresso and pastry will help give you the energy to start your long day. 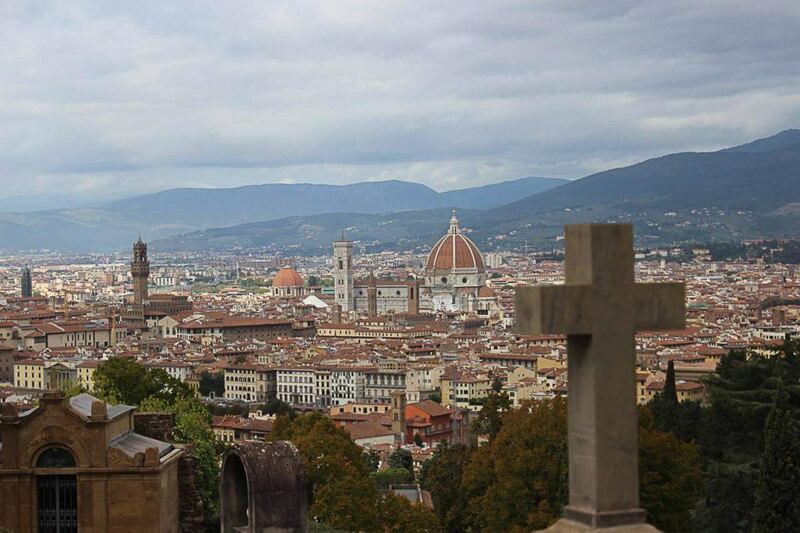 Begin your day in Florence by climbing the steps to the Duomo at Santa Maria del Fiore. This will require purchasing a ticket, scheduling an appointment ahead of time, and printing out your ticket. Some websites claim that you can show proof of purchase on your phone but this is false. You must bring your pre-printed ticket to gain admittance. The top of the Duomo offers an unrivaled panoramic view of the city and can help orient you to the city’s layout. Once you’ve made your way back down the 463 steps of the Duomo you may find yourself in the mood for a snack and perhaps another espresso. Remember, in Italy gelato is not a dessert but rather a snack. You can find all of our favorite gelato places throughout the city here but I suggest going to the closest one. Perché No is a great gelato storefront that is easy to find and is located directly between the Santa Maria del Fiore and your next stop, Piazza della Signoria. Piazza della Signoria is rich with historical significance making it a “must see” when visiting Florence. This piazza, dating back to the early 1300’s, was the original home of Michelangelo’s “David”. A replica now stands in its place after the original was moved to the Academia. The piazza houses the Palazzo Vecchio, the town hall of the city, and is one of the most significant public places in Italy. The Loggia dei Lanzi, located adjacent to the Palazzo, is an open air sculpture gallery of Renaissance art. The piazza is also the gateway to the Uffizi Gallery, one of Florence’s most famous museums. Neptune’s fountain, Tribunale della Mercanzia, and Palazzo della Assicurazioni Generali are all also found here. In short, Piazza della Signoria is not to be missed, it’s one of the top attractions in Florence. Once you have taken in all the sights Piazza della Signoria has to offer, you will likely be ready for some lunch and questioning yourself where to eat in Florence. A short walk from the piazza will take you to a street that is famous for their delicious affordable sandwiches and charcuterie, Via dei Neri. You will know you are in the right place when you see the large crowds of travelers and locals alike waiting to purchase sandwiches. All’Antico Vinaio is so famous for their sandwiches they have three locations on the same street, and all of them will have a long line for lunch (however don’t be deterred, the lines move quickly). Currently costing only 5 euro, these sandwiches are large enough to feed two. If you feel like having a sit down meal, you can try one of the charcuterie places, such as La Prosciutteria, that offer meat and cheese boards with delicious Italian wine. After a thoroughly satisfying meal, it’s time to move again. As you only have 24 hours in Florence, you can’t waste time. 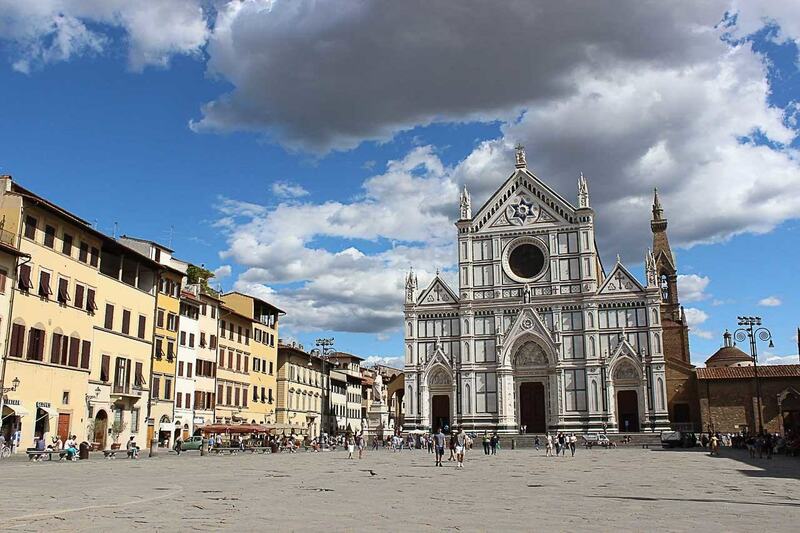 Find your way to the Basilica Santa Croce, also known as the Temple of Italian Glories. It has earned this nickname because it is the burial place of some of the cities most illustrious residents such as Michelangelo, Galileo and Machiavelli. The church houses beautiful works of art such as early Renaissance frescoes by artist like Giotto. The piazza in front of the church is a popular hangout area for locals and host farmers/ artisanal markets throughout the year. It is also home to the ancient annual tradition of calcio storico, a sport that’s a hybrid of Rugby and bare-knuckle fighting. Our list of things to see in Florence is far from the end, directly south of Santa Croce is San Niccolò, the next leg in your journey. You can cross the Arno river via the bridge Ponte alle Grazie but take the time to admire the view of the Ponte Vecchio located directly west of you. Tons of tourist crowd Ponte Santa Trinita every day to get pictures of the Ponte Vecchio but Ponte alle Grazie is usually empty. 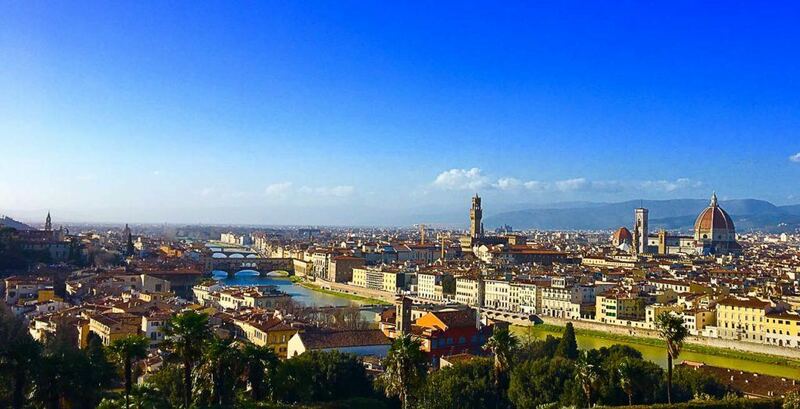 Once across the bridge, make the trek up to Piazzale Michelangelo. 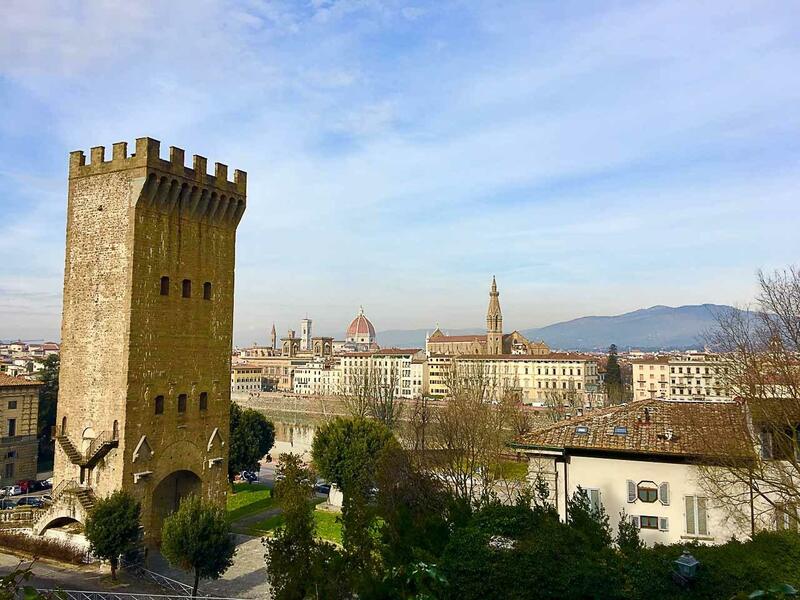 On your way, you will pass by the impressive Torre di San Niccolò, a well preserved gate to the former defensive walls of Florence that was erected in 1324. When you reach the top of Piazzale Michelangelo, you will understand why it’s one of the top places to visit in Florence. The breathtaking view is where millions of visitors every year flock to see the sunset. If the crowds of visitors are too much, head 5 minutes up the road to San Miniato. San Miniato is a church, monastery, and cemetery that has an equally beautiful view of the city but with none of the crowds. If you happen to be there by 5 pm you will get a chance to hear the monks singing Gregorian chants. A bit of local life on your 24 hours in Florence. Depending on your level of hunger, either before or after going to Piazzale Michelangelo I suggest visiting Osteria Antica Mescita San Niccolò. It is located very close to the Piazzale and is a locals only restaurant that serves delicious Tuscan food. They even have a dining area located in the former crypt of the church, for me it’s one of the best restaurants in Florence. Remaining on the south side of the Arno, finish your night in Santo Spirito, the best spot to end your 24 hours in Florence. This hip neighborhood comes alive in the evening with countless wine bars and aperitivo. This is where the young residents come to have drinks and socialize. It is not uncommon to find live music as you make your way through this historic neighborhood. There will always be more to see in Florence, even on extended holidays. We have hosted multiple guests over the last year and always try to make sure they get the most out of their stay. This route has allowed us to cover the most ground in one day in Florence and left our visitors feelling like they truly experienced the essence of it. This city is a magical and unforgettable place to visit, I hope you enjoy your 24 hours in Florence and plan to come back for more. 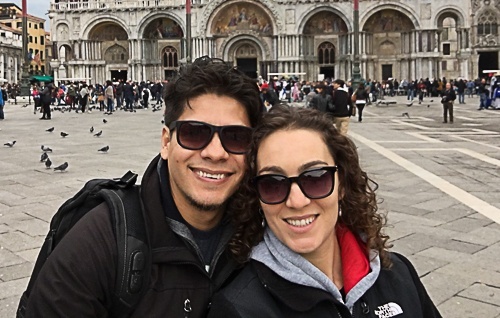 Briana and Javier are two expats from California, who are living in Florence, Italy. In 2017, they quit the rat race and sold off their belongings so that they could move abroad. Briana works with disabled children and Javier is a private chef. They run a travel and lifestyle blog called A dash of Life and YouTube channel. You can follow them on Instagram and Facebook.